A B-52 bomber successfully released a JDAM precision-guided bomb from its internal bomb bay for the first time in test. The U.S. Air Force (USAF) successfully tested a new internal rotary bomb launcher installed in the internal weapons bay of a B-52H long-range heavy bomber, according to a July 19 USAF press release. The B-52 aircraft dropped a Joint Direct Attack Munitions (JDAM) precision-guided bomb from its internal weapons bay for the first time. JDAM is a guidance kit that converts unguided bombs into precision-guided munition. “According to a release from Edwards Air Force Base, California, the B-52 Joint Direct Attack Munition Internal Weapons Bay Upgrade program recently completed developmental test at Edwards where it successfully demonstrated employment of JDAM munitions from the new Conventional Rotary Launcher,” the USAF reports. Tests of the digitized rotary launcher will continue and test crews are currently working to integrate the ADM-160 MALD (Miniature Air-Launched Decoy) decoy as well as the Lockheed Martin AGM-158B Joint Air-to-Surface Standoff Missile (JASSM) with the B-52’s new launch system. The integration of the weapons and the new launch system is slated to be completed by 2018. As I reported previously (See: “US B-52 Bomber to Get New Long-Range Cruise Missile”), B-52H bombers will also be fitted with a new extended range JASSM, dubbed JASSM-ER, which will increase the aircraft’s JASSM strike distance to 500 nautical miles (926 kilometers). The current upgrades of the B-52H fleet—the only B-52 variant still in service—are part of an overall new USAF strategy to counter growing anti-access/area denial threats facing aircraft. The arsenal plane/fifth-generation fighter jet interaction would be similar to the artillery observer and artillery battery in ground warfare: The fifth-generation aircraft will first identify and then direct fire from the arsenal plane unto a target. Depending on the battlefield environment, the arsenal plane would carry long-range standoff missiles such as the Joint Air to Surface Standoff Missile (JASSM) to in order to stay outside the enemy’s air defense perimeter, or — when engaging a technologically less advanced adversary — move closer and drop precision-guided bombs. The development of an arsenal plane that can launch its weapons from the outside of a defended airspace and the coverage of long-range surface-to-air missiles is a direct response to the growing air defense capabilities and recent advances in military technology of countries such as China and Russia. 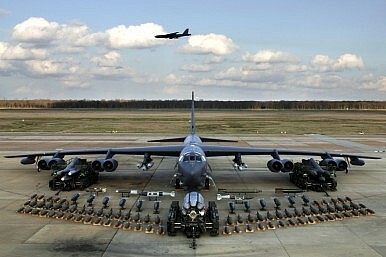 The U.S. Air Force’s B-52 bomber just became a lot deadlier.